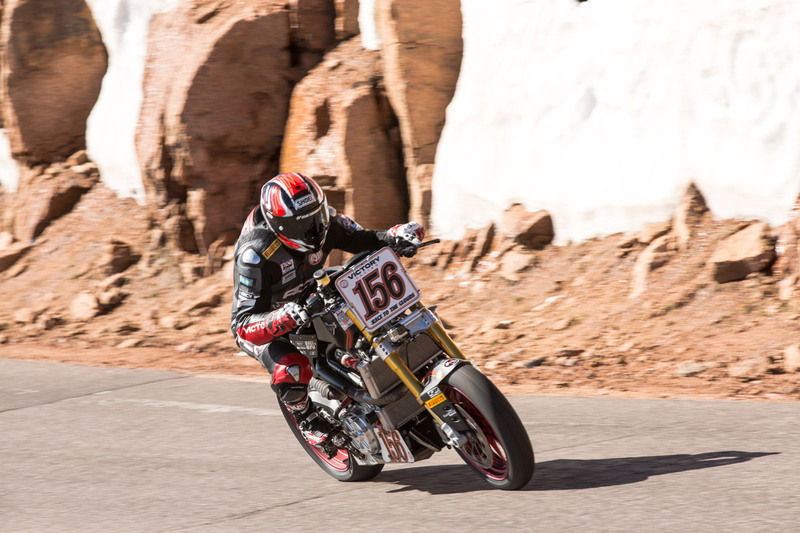 Victory Motorcycles is proud to announce that Victory Racing’s electric Empulse RR ridden by Cycle World’s Road Test Editor Don Canet and the gas-powered Project 156 piloted by Jeremy Toye won their respective classes at the 2016 Pikes Peak International Hill Climb (PPIHC) and took second and third overall. 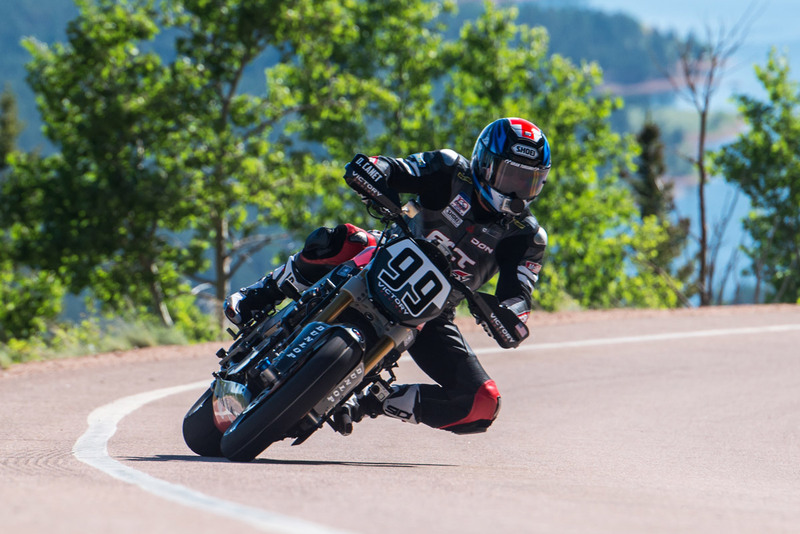 In the overall PPIHC motorcycle competition, Canet and the Empulse RR placed 2nd while Toye and Project 156 placed 3rd, both closely following veteran racer Corsican Bruno Langlois and his Kawasaki Z1000 who benefitted from a dryer and warmer course later in the morning due to a series of red flags. Canet and his Empulse RR clocked a time of 10:17.813 with an average speed of 69.9 mph through the 156-turn course that takes racers from 9,390 feet above sea level to the mountain’s summit of 14,115 feet above sea level. The 12.42-mile course is split into four sections. Canet zipped through the flowing section #1 in 1:50.531, the steep section #2 in 2:26.924, the technical section #3 in 2:53.568 and the longer, high elevation section #4 in 3:06.790. 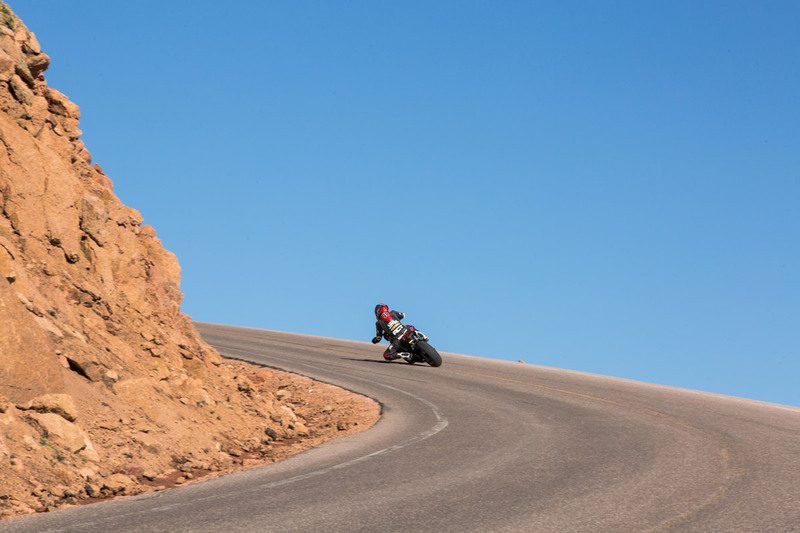 Toye rode Project 156 to the Pikes Peak summit in a time of 10.19.777 with an average speed of 69.7 mph. He and his Project 156 bellowed through section #1 in 1:52.520, section #2 in 2:27.213, section #3 in 2:53.375 and section #4 in 3:06.669. 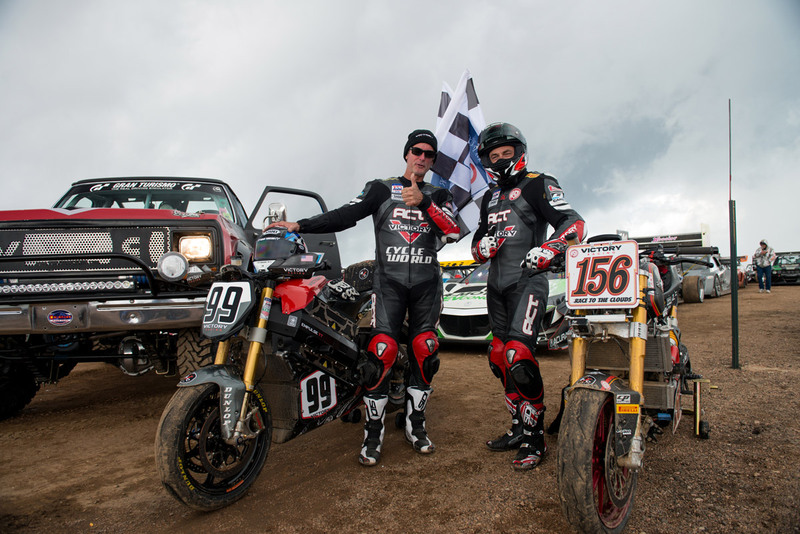 Victory Motorcycles was the only manufacturer at this year’s PPIHC to race both electric and gas-powered race vehicles. The Victory Empulse RR is a race-prepped version of the Victory Empulse TT and built on the legacy of the motorcycle that took 3rd place in last year’s SES TT Zero Challenge at the Isle of Man TT with rider Lee Johnston. It is a completely different bike than the electric Victory RR that achieved a 2nd place podium finish with William Dunlop at this year’s recent Isle of Man TT. While the base frame and overall design of the Empulse RR are essentially the same as the production Empulse TT, a more aerodynamic and lighter monocoque carbon-fibre subframe is used and the battery, controller, and Parker Hannifin-sourced motor have been upgraded with repackaged battery cells offering more capacity, new motor windings and an updated control system and wire harness. Visual differences from the version raced last year in the SES TT include an upright riding position, reduction of bodywork and the addition of hand guards. Project 156 is a custom race bike built in association with Roland Sands Designs to serve as a test bed for a prototype engine that Victory race technicians developed to analyze the limits of the powerplant that now propels the new Victory Octane production motorcycle. Garnering what was learned from Project 156, the production version of the 1200cc Octane engine was born. Canet placed well in qualifying aboard Project 156 in 2015 but was unable to finish the run only a few miles from the top of the mountain due to a fueling issue. This year, the bike’s engine cooling, lubrication system and fuel system had been massaged to better deal with the dramatic changes in the elevation of the course – particularly at lower RPM to further help Toye squirt out of the tight switchbacks.